As of now science says the best prescription to slow the effects of aging is regular exercise and a healthy diet, while maintaining a healthy body weight. A habitually healthy eater, Frank Hu stocks his refrigerator with fresh fruits and vegetables, fish, and chicken. His pantry holds brown rice, whole grains, and legumes, and his snack cabinet has nuts and seeds. He eats red meat only occasionally, rarely buys white bread, soda, bacon, or other processed meats. He’ll purchase chips and beer, but only now and then, mostly when entertaining friends. When it comes to eating smartly in ways that can help us keep fit and live longer, Hu knows best. Hu took over the Department of Nutrition at the Harvard T.H. Chan School of Public Health in January. His eating habits are greatly informed by his research on what constitutes a healthy diet. While he knows they’re not for everyone, he says people can nonetheless move toward eating patterns that both appeal to them and help them stay well. And so, according to considerable research, can all those who want to reduce the risk of obesity, diabetes, cardiovascular diseases, and other chronic illnesses, and increase both longevity and quality of life in old age. To some extent, when it comes to healthy aging, we become what we eat. According to the Centers for Disease Control and Prevention (CDC), one in four deaths results from heart disease, the leading cause of death in the United States. Among the top risk factors are obesity, high cholesterol, high blood pressure, and poor diet — with the first three often tied to the last. The rise in obesity has hit the United States hard. More than a third of adults and one-fifth of children and adolescents age 2 to 19 are obese. Research shows that sustained, thoughtful changes in diet can make the difference between health and illness, and sometimes between life and death. For more than 50 years, researchers who have studied the link between diet and health have extolled the virtues of the Mediterranean diet, with its emphasis on vegetables, fruits, legumes, nuts, whole grains, olive oil, and fish, and its de-emphasis on red meat and dairy. Pioneering studies, such as one led by nutrition expert Ancel Keys in the late 1950s, helped establish the Mediterranean diet as the benchmark. Keys’ landmark Seven Countries Study, which promoted diets low in saturated fats (beef, pork, butter, cream) and high in mono-unsaturated fats (avocados, olive oil), showed decidedly lower risks of cardiovascular disease. Funded by the National Institutes of Health, the Nurses’ Health Study was established by Frank Speizer in 1976 to examine the long-term consequences of oral contraceptives. In 1989, Willett established NHS II to study diet and lifestyle risk factors. The results of that study have heavily influenced national dietary guidelines and the way Americans think about how they should eat. Researchers also generally approve of both the vegetarian diet and the Asian diet because they also help increase longevity and decrease the risk of chronic disease. But the Mediterranean reigns supreme, because the Asian diet has salt and starch, and the vegetarian lacks important nutrients. 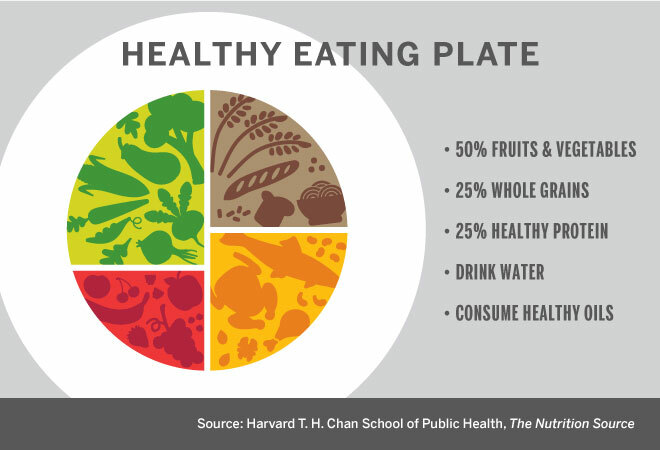 To publicize everyday ways to eat better, researchers at the Harvard Chan School came up with the Healthy Eating Plate. It suggests eating more fruits and vegetables, whole grains, fish, lean poultry, and olive oil, and asks people to limit refined grains, trans fats, red meat, sugary drinks, and processed foods. In addition, it touts staying active. 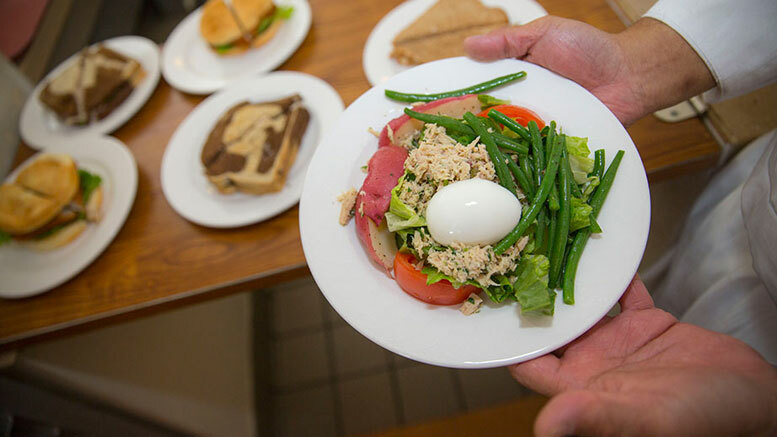 Harvard’s plate was a response to the U.S. Department of Agriculture’s (USDA) MyPlate, which, a comparison by Harvard nutrition experts suggested, could have gone further in detailing information about which foods to favor or limit. A 2012 Harvard study found that eating red meat led to increased cardiovascular disease and cancer mortality, and that substituting healthier proteins lowered mortality. As for milk, a source of calcium, Willett said there is no evidence that drinking more of it prevents bone fractures as much as physical activity does. Yogurt, because of its positive effects on the intestinal system, proves even more beneficial than milk. What is hard to overstate is the importance of eating healthily and mindfully through life, but the good news is that benefits begin as soon as the improved diet does. “If you’re still alive, it’s never too late to make a change in our diet,” said Willett. Recent studies have found that a healthy diet can also boost the brain and slow cellular aging. Researchers are examining the role of coffee and berries in improving cognitive function and reducing the risks of neurodegenerative diseases. At the same time, researchers keep circling back to the Mediterranean diet as a model of healthy eating. In a 2015 study in Spain, seniors who ate a Mediterranean diet, supplemented with olive oil and nuts, showed improved cognitive function compared with a control group. Rich in antioxidants and polyphenols, chemicals that help avert the harm of “free radicals” in the body, the Mediterranean diet may even help prevent some degenerative diseases that, to some degree, are caused by vascular aging and chronic inflammation, Hu said. The research shows promising paths ahead. In a 2014 study, Hu found a correlation between the Mediterranean diet and telomere length, a biomarker of aging. Telomeres — caps at the end of chromosomes that protect them from deterioration — may hold a key to longevity. Their lengthening slows the effects of aging, and their shortening is linked to increased risks of cancer and decreased longevity. As of now, science says the best prescription to slow the effects of aging is a mix of factors, from regular exercising to a healthy diet to maintaining a healthy body weight. Hu said his own diet is a fusion of the Mediterranean, Asian, and vegetarian models, and he tries to combine the healthiest elements of each. In general, he avoids the problematic components of the Western diet: sugary foods, processed meats with high amounts of preservatives, sodium, and saturated fats. Yet he reminds even healthy eaters that it’s fine to indulge in treats occasionally. After all, a long life should be worth living, and food is one of its joys. 1 Comment on "Eating Better Can Help You Live a Healthier, Longer Life"
A new documentary film called: “What the Health?” raises awareness of the pitfalls of animal protein, including eggs and fish, and puts forth the proposition that animal protein is completely unnecessary for human health; in fact it is very detrimental to both the human body and the Planet. The effects of 18 Billion beef cattle on world fresh water supply, and well as the high amount of manure from both cattle, pigs, and domestic fowl causes vast amount of atmospheric, and water pollution, through runoff from fields treated with animal manure, and the entry of methane from cattle creates more global warming (CO2) than all transportation systems in the world combined. A sister film, called “Cowspiracy”, goes into the perils of cattle production in great depth. These films are a must to see for anyone who eats with the planet in mind. Fish are not safe either, because of high mercury levels.